I couldn’t find a simple pork roast today which is what I felt like for dinner, and all I could find was this huge boneless pork neck. I bought it and cut it in half as we are only 3. 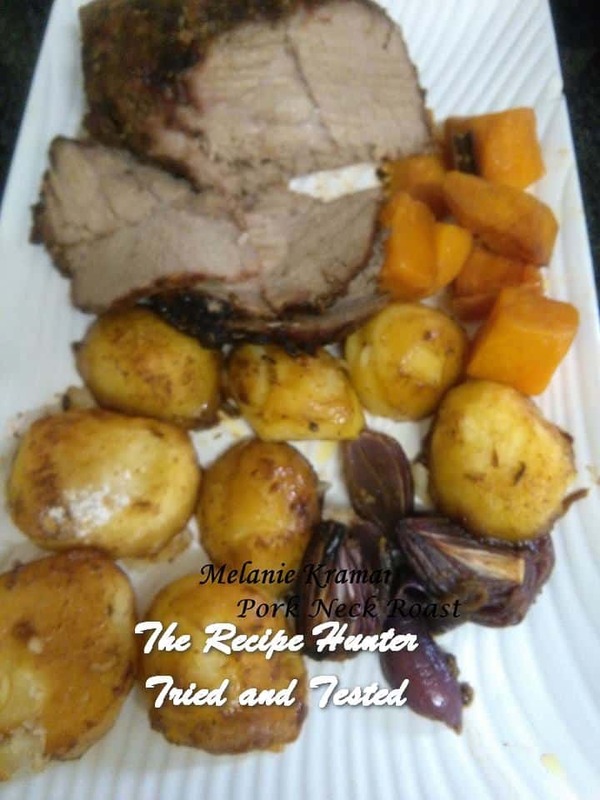 I served it with roast potatoes and sweet pumpkin. With a sharp-pointed knife make stabs in the fillet. Mix everything from fennel seeds too garlic past in glass bowl. With clean hand massage into the pork neck. Place into a roasting pan. Scatter onion quarters and garlic cloves around. Add apple cider vinegar to chicken stock. Pour around the pork (not over). Lower oven temperature to 170 degrees. Roast uncovered for about 75-90 minutes. Thicken sauce on hot stove by adding 1/4 cup boiling water and making a paste with 2 tsp corn starch, water and some hoisin sauce. Parboil potatoes in salted water till half-cooked, Drain. Season with salt, pepper, aromatic roast potato spice. Add to oil that has been preheated in a 180 degree oven and roast until golden crispy. Melt 2 tblsp butter in saucepan. Lower pan to lowest heat and add pumpkin, butter, sprinkle sugar, add cinnamon and black pepper. Cook until pumpkin soft and caramelized at the bottom.